It's almost comical how big the kitchen is. 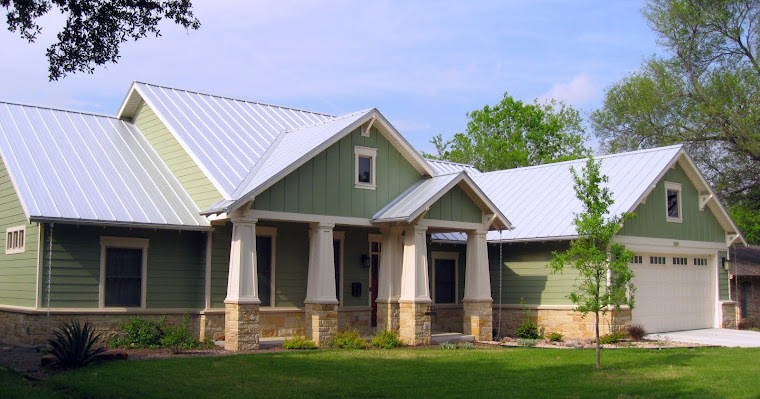 (I've learned that's what happens when I let Steve do the designing.) Our kitchen in the condo had the storage space of just one wall of this kitchen. It's going to be nice not to have to cram things into drawers and store kitchen things in other rooms because we've run out of space. 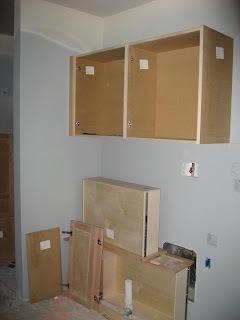 The installers also started on the mudroom cabinets yesterday. We always knew we wanted cabinets in there but didn't have them in the original cabinet bid because we were trying to keep the cost down, and it would have been possible to add these cabinets later. When we were discussing some other changes, our cabinet guy suggested getting a number to add these. 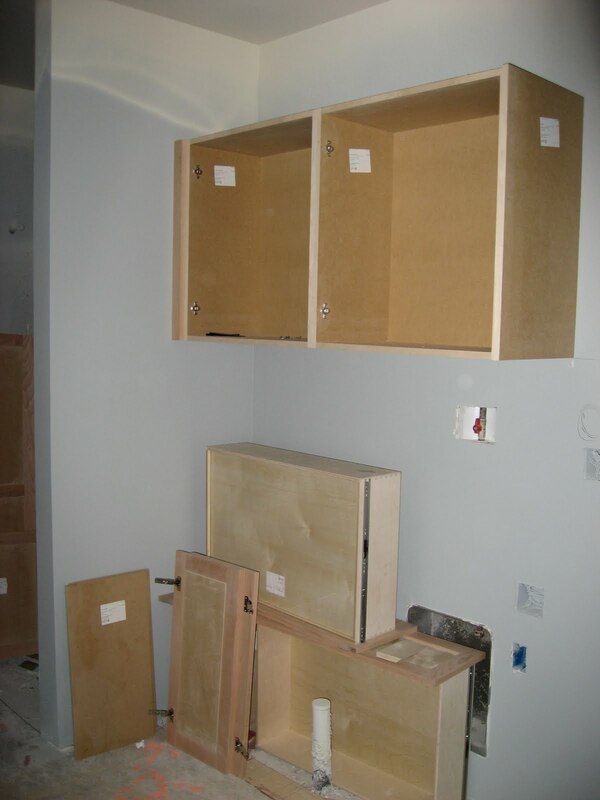 Either their costs had come down since the original bid, or they always estimate high because they know clients will want to add features, because we got these four cabinets plus a few other add-ons for just barely more than the original bid. 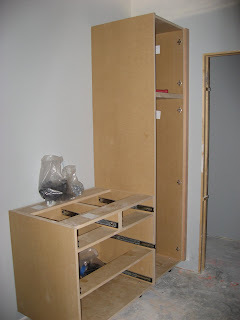 The cabinets in the picture below will be above the washer and dryer. Between these cabinets and the drawers under the washer and dryer (and the cabinets across the room, shown above...and the cubbies on the wall next to them), I don't know how we are going to fill all of this space. R is using several new subs on our house, and trim is one of them. Instead of Trim-Tech, he's trying out Tri-Supply -- which sounds like a triathlon store. R has alluded to Tri-Supply (among others) throwing in some upgrades for us in order to woo R -- which we're happy to help them do.